Karen Augustine stands outside the shelter where her two dogs were euthanized. 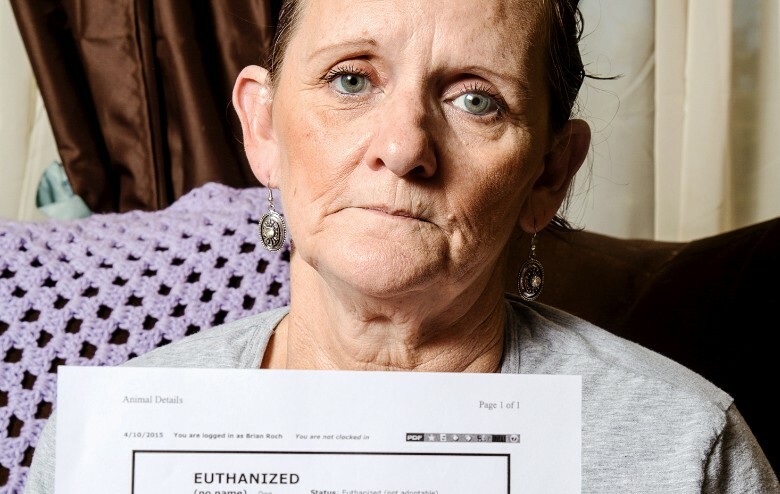 After spending more than a month taking care of her dying father in 2010, Texas resident Karen Augustine returned home to face yet another nightmare. While she was away, she learned that animal control had killed her beloved dog Tank and seized her puppy Achilles -- who she later learned was also killed. And she was being charged hundreds of dollars in fines. The offense? Her dogs were off-leash in the front yard. A family member who was staying at her home while she was away had let her dogs out, Augustine said. An animal control officer then spotted the dogs, and he immediately impounded them. When Augustine's children called to tell her what happened, she knew they couldn't afford to pay the fees that the shelter was charging to get the dogs back. She figured that the agency would hold on to the dogs until she returned a few weeks later to work everything out and said she was not told that they could be killed. "It was absolute madness -- I couldn't believe it," said Augustine, 56, who still gets tearful talking about the incident. "They had Tank put down, [he was] euthanized -- gone -- before I even got back to Texas." Augustine with the paperwork showing Tank had been euthanized. Hays County Animal Control officer Brian Roch said in a statement that no one was present at Augustine's home when he seized her dogs, and that he had been called to her home multiple times for the dogs being loose in the past. 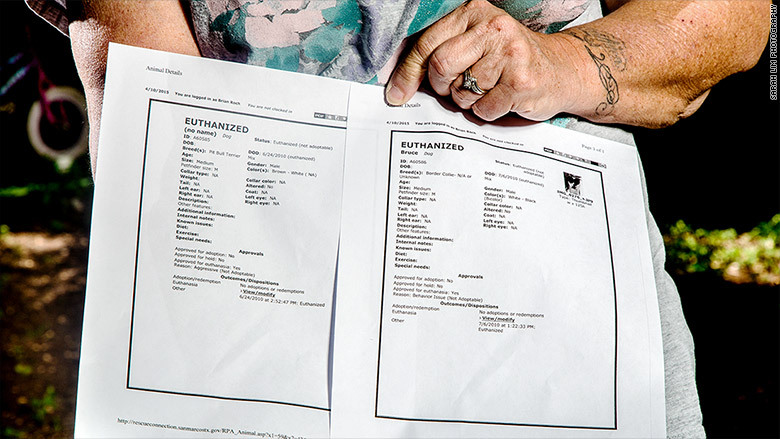 Shelter records obtained through a CNNMoney public records request show that Tank, a pit bull, was euthanized for "aggressive behavior" three days after being impounded. Achilles, a Border Collie puppy, was killed two weeks after he was taken from the yard because he was deemed unadoptable due to "behavior issues." It wasn't until CNNMoney requested documents from Hays County Animal Control that Augustine learned Achilles was also killed. All of these years, she thought he had been adopted by another family. Under Texas law, unidentified dogs only need to be held for 72 hours before they can be euthanized. According to fee information disclosed by the shelter, Augustine would have had to pay a combined $180 in shelter fees to reclaim Tank and Achilles if she had arrived at the shelter the day of Tank's euthanization. Five years after they were seized from her yard by animal control, Augustine learned that both dogs were put down. 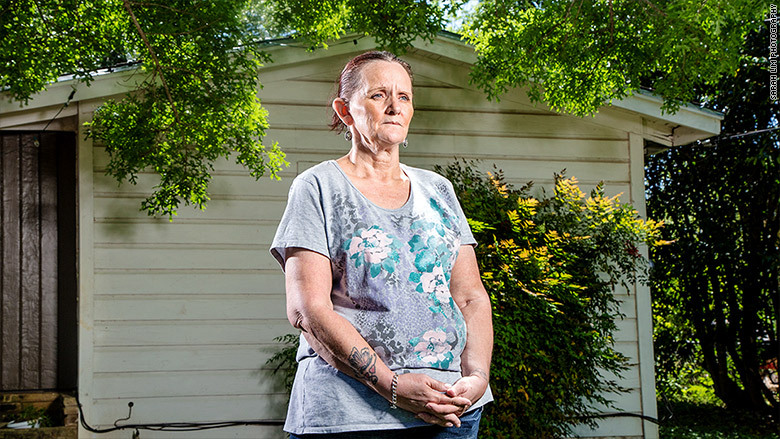 She remembers the bill being higher, but even $180 would have been difficult for Augustine -- who struggles with chronic pain that has kept her from working for years. She was also facing a separate bill from the county for six dog-related violations (all stemming from the one incident when her dogs were seized) -- amounting to $660. While this payment wasn't required to get her dogs back, she knew that failing to pay it would get her in trouble with the law. Five years later, Augustine's nightmare is far from over. After she missed a court hearing because she couldn't afford to pay the fines, the $660 bill grew to $1,248. On top of that, six warrants were issued for her arrest (one for each violation) -- all of which remain outstanding today. Augustine now lives in constant fear of ending up behind bars, and says she has no idea how to make the warrants go away. She already owes thousands of dollars in medical bills due to her fibromyalgia. And the $1,700 in Social Security disability benefits she receives for herself and her autistic grandson -- who she has custody of -- barely covers her rent and utilities each month. Augustine moved into this home after losing her previous one to foreclosure. She was living in her old home when her dogs were seized. 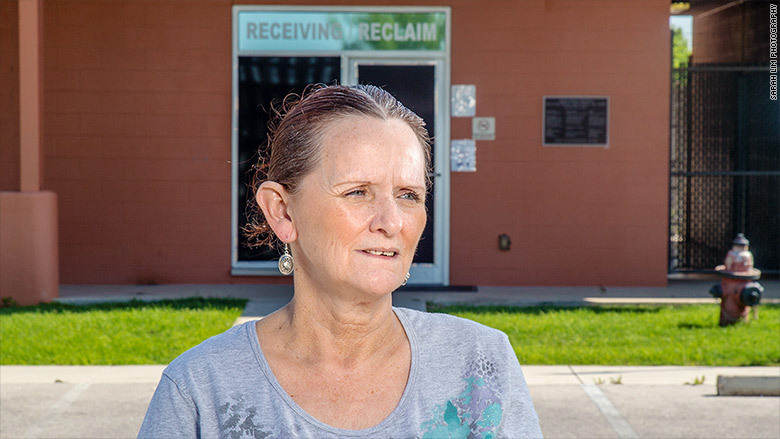 Hays County Justice of the Peace Beth Smith told CNNMoney that Augustine could apply for a payment plan. Or, if she had low enough income, she could settle her debts through community service. But she would have to show up to court first. But many low-income Americans, like Augustine, don't realize there are other options. Often, they fear that going to court without any money to make payments will mean a judge will promptly throw them in jail. "The risk is real that they will be incarcerated because they can't pay," said Sam Brooke, an attorney with the nonprofit Southern Poverty Law Center, who specializes in economic justice issues. "We're seeing this all over the country." 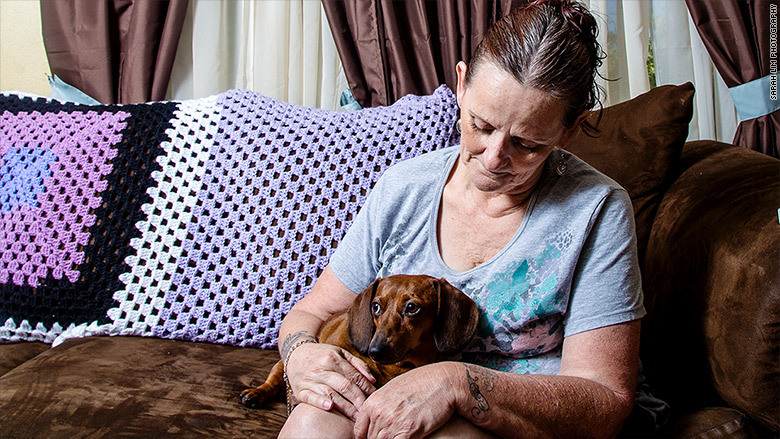 A recent CNNMoney investigation found that thousands of warrants have been issued across the country for unpaid fines related to small pet-related violations. In addition, a number of dogs have been killed because their owners couldn't pay fines and fees in time to save their lives. In Augustine's case, her financial problems have led to other brushes with the law. A decade ago, she ended up in jail twice for less than a day each time after bouncing checks for veterinary expenses and groceries for her family. She attempted bankruptcy proceedings in 2013, but gave up when even that was too expensive. Still a dog lover. Augustine sits with her Daschund, which she adopted after losing Tank and Achilles. And her situation just keeps getting worse. Next year, she won't even be able to renew her state ID card (she doesn't have a driver's license) unless the charges are cleared. But even if she can get the money together to pay off her fines or clear the charges through community service and get her life back on track, she will never be able to get her dogs back. "To have [Tank] taken away from us and put down like he was nothing," said Augustine, before she discovered that Achilles had been killed, too. "They could give us a million dollars, but there's no amount of money they could give me that could replace the love we had for this dog." What should CNNMoney investigate next? Tell us here or email us at CNNMoneyInvestigates@cnn.com.